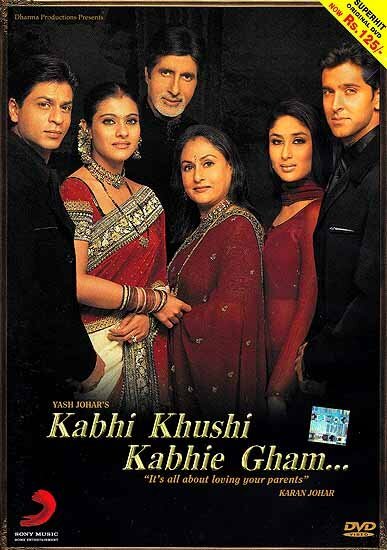 ‘Kabhi Khushi Kabhie Gham’ is the story of an Indian family headed by a business tycoon, Yashovardhan Raichand (Amitabh Bachchan) and his wife Nandini (Jaya Bachchan) who have raised their sons, Rahul (Shah Rukh Khan) and Rohan (Hrithik Roshan) showering them with love and affection. When Rahul finds out that he is adopted at the tender age of 8 years, it becomes the reason for his unending gratitude for his parents - more so his father. His father’s every wish becomes a command for Rahul. A command he never breaks - till the day he falls in love with Anjali (Kajol) a young boisterous girl who is a complete misfit in the High Society World of the Raichands. When his father disowns Rahul, he takes Anjali and her little sister Pooja (Kareena Kapoor) and leaves for London. Karan Johar achieved dizzy heights with his maiden film Kuch Kuch Hota Hai, and now sets new standards in Indian Cinema. Yash Johar and Karan assembled the largest star cast ever and created one of the most spectacular and successful films in the history of Indian Cinema. Shooting straight in at number 3 in the UK Top charts, K3G ranks as the highest grossing Indian film in the overseas market, surpassing Karan Johar’s debut film. Presented in Anamorphic wide-screen format. Amitabh Bachchan Jaya Bachchan Shah Rukh Khan Kajol.